Marcus is working with computer games mostly in the subject of Media Arts, Aesthetics and Narration but also in connecting fields at the School of Informatics. 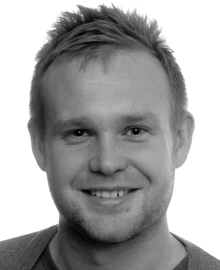 He is program coordinator for Computer Game Development - Game Writing together with Torbjörn Svensson. The Mystery of St: Elin. Project manager for the pre-production of the iPad game The Mystery of St:Elin during spring 2013. The game is a research platform to study knowledge transfer with digital games. Can you, as a youngster (8-12 years old) understand a city's development and growth through participation in a location based pervasive game. In the game you are to help Elin, 13 years old, to complete tasks at 5 different locations in central Skövde. Dataspel – forskning och utveckling (Computer games – research and development) Forskarfredag, Delagardiegymnasiet Lidköping, 2014. Invited speaker. Verklighetsbuggar (Reality bugs) Science Slam, Forskarfredag Skövde, 2013. Evolution: Konst + vetenskap = Super Mario (Evolution: Art + science = Super Mario) Science slam, Forskarfredag Skövde, 2012. Informationsdesign – nya sätt att gestalt och förmedla berättande Presentation at the seminar "Om inkluderande arbete, interaktiv design och effektmål utifrån utställningsprojektet "Det ligger i tiden". (About interactive design and effect in the exhibition It´s about time.) 11-12 February 2015 at the Regional museum in Kristianstad, Sweden. A computer game for an enhanced visitor experience. Game and Entertainment Technologies MCCSIS/GET 2014, Lisboa Portugal. Evolution: Konst + vetenskap = Super Mario (Evolution: Art + science = Super Mario) with Lars Vipsjö at Röntgenveckan 2014, Göteborg. Invited speakers. Enhanced game experience through novel interface design. Under the Mask 2011, Luton England. Backlund Per, Engström Henrik, Berg Marklund Björn et al. 2017 9th International Conference on Virtual Worlds and Games for Serious Applications (VS-Games): Proceedings (15-22). IEEE Computer Society Digital Library, 2017. Toftedahl Marcus, Berg Marklund Björn, Engström Henrik et al. Decoding the Academic-Industrial-Gameplay Complex: Digital Game Practice, Research and Study in China, Taiwan and Chinese-Speaking Regions . 2016. IE2014 Proceedings of the 2014 Conference on Interactive Entertainment (1-10). ACM Digital Library, 2014. Alklind Taylor Anna-Sofia, Backlund Per, Bergman Maria Elena et al. Skövde: Högskolan i Skövde, 2012.